Well, I believe that is a question too vague to classify for a riddle, eh? Well, I had to draw your attention. Actually, my story is a bit more complicated than that. Not so long ago I received an antique gospel book. It was sold for relatively low price because, quote, "a previous owner has made pointless remarks inside and ruined the leather cover". I didn't give much attention to the fact, but was really surprised when I saw the book. First of all, on the back cover the words "Why did the chicken cross the river?" were cut (yes, this made me chuckle too). Second of all, inside the book there were occasional phrases written in red and blue ink. Weird... phrases. They appeared to be of a question-and-answers joke, or, how my younger friends tend to call them 'setup-punchline' jokes. I've made some research on the ink and the book -- it appears, both the book and the jokes date back to 1600-s, probably originating from some not-so-faithful priest practicing his humorous skills on the paper he could get. I was very intrigued. After thorough look through the pages, I have found 22 questions and, unfortunately, only 12 answers. I still believe, however, that all answers were in the book, but the blue ink was less long-lasting, leaving just a speck of blue instead of some answers. Counting the specks altogether with answers, I got the same 22. Judging by the size of specks, the missing answers are strangely short, I'd say, one word each. 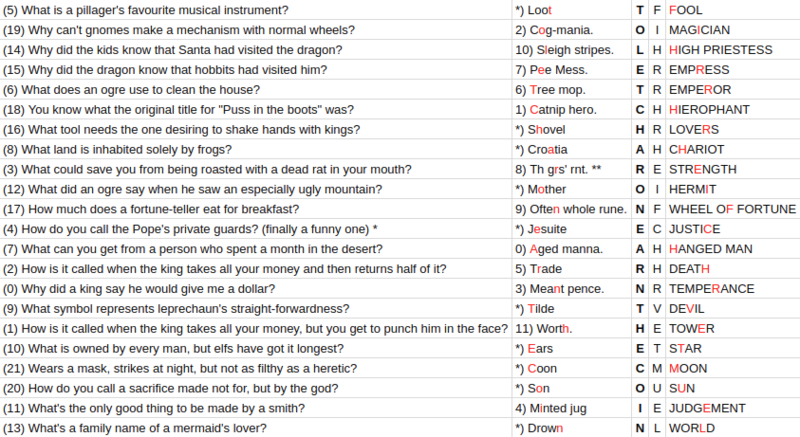 Further down I present all the phrases I found. The order is random - seeing how setup and punchline often got into completely different places, I believe, the Jester's intention was to write them at random places. (0) What is a pillager's favourite musical instrument? (1) Why can't gnomes make a mechanism with normal wheels? (2) Why did the kids know that Santa had visited the dragon? (3) Why did the dragon know that hobbits had visited him? (4) What does an ogre use to clean the house? (5) You know what the original title for "Puss in the boots" was? (6) What tool needs the one desiring to shake hands with kings? (7) What land is inhabited solely by frogs? (8) What could save you from being roasted with a dead rat in your mouth? (9) What did an ogre say when he saw an especially ugly mountain? (10) How much does a fortune-teller eat for breakfast? (12) What can you get from a person who spent a month in the desert? (13) How is it called when the king takes all your money and then returns half of it? (14) Why did a king say he would give me a dollar? (15) What symbol represents leprechaun's straight-forwardness? (16) How is it called when the king takes all your money, but you get to punch him in the face? (17) What is owned by every man, but elfs have got it longest? (18) Wears a mask, strikes at night, but not as filthy as a heretic? (19) How do you call a sacrifice made not for, but by the god? (20) What's the only good thing to be made by a smith? (21) What's a family name of a mermaid's lover? Where is the puzzle, Tom? 1) What are the unanswered setups? 2) What are their missing punchlines? 3) And most importantly... Why. Did. The chicken. Cross. The river. I need to know that. Who knows, maybe it's the only good joke in the bunch? * 'finally a funny one' was written by the Jester. I suppose, this joke was exceptionally good. ** it's the original spelling, "Th grs' rnt", not a damaged text. One of the phrases that raised my suspicion. do ogres truly die of sunlight? The rest of the list is smudged. I'll keep looking for more clues though. After getting a hint on the order from phenomist, I found the correct pattern to order the questions properly. The questions are rewritten in the right order now. For the same reason, I add tag "cards" to the puzzle. P.S: Maybe it really was unsolvable without the proper order. I apologise then. Now that all the key plotpoints have been revealed, we need a hero to connect the dots. I think I have the final answer. It is heavily based on the work of others, mostly @phenomist, @Chowzen, @VictorStafusa, and those who they have referred to. Please upvote them all. need one letter replaced, and rearranged. The resulting expressions each represent a card in the Major Arcana. If we order the answers according to the ordering of the cards in Major Arcana, and read the letters that got replaced in the original answers in this order, we get the ultimate answer to the ultimate question. So why did the chicken cross the river? To let Charon earn the coin. Th grs' rnt. with R replaced with an E anagrams to STRENGTH. Following this observation, I anagrammed the answers plus a letter. I did this for CATNIPHERO and one of the words was HIEROPHANT. Aha! These words are the 22 Major Arcana! To help confirm this, the Fool can be numbered 0, just like how our questions are ordered. From the hint, JESUITS are one letter anachange from JUSTICE, so it's probably relevant. So we still need anachanges from: Fool, Lovers, Chariot, Hermit, Devil, Star, Moon, Sun, World. "What is a pillager's favourite musical instrument?" is LOOT/LUTE, and LOOT can in fact be made from FOOL, which is neat. Perhaps Q2 is CHARITY from CHARIOT, and Q4 is JESUITS. Q16 is probably GLOVES from LOVERS. Unfortunately the search space is quite large and the jokes aren't totally clear cut, so maybe I'm missing some additional correspondence. While the questions are numbered 0-21, they don't directly correspond to Arcana cards 0-21. Documenting the letter changes in Major Arcana order, the new letters seem to spell TO LET C??R?N?ARN?H?? ?I?, which could be the answer to the chicken riddle. 0) Why did a king say he would give me a dollar? (1) How is it called when the king takes all your money, but you get to punch him in the face? (2) How is it called when the king takes all your money and then returns half of it? (3) What could save you from being roasted with a dead rat in your mouth? (5) What is a pillager's favourite musical instrument? (6) What does an ogre use to clean the house? (7) What can you get from a person who spent a month in the desert? (8) What land is inhabited solely by frogs? (9) What symbol represents leprechaun's straight-forwardness? → 9) Often whole rune. (10) What is owned by every man, but elfs have got it longest? (11) What's the only good thing to be made by a smith? (12) What did an ogre say when he saw an especially ugly mountain? (13) What's a family name of a mermaid's lover? (14) Why did the kids know that Santa had visited the dragon? (15) Why did the dragon know that hobbits had visited him? → 8) Th grs' rnt. ** ( Th(e) (O)gr(e)s' (Bu)rnt )??? (16) What tool needs the one desiring to shake hands with kings? (17) How much does a fortune-teller eat for breakfast? (18) You know what the original title for "Puss in the boots" was? (19) Why can't gnomes make a mechanism with normal wheels? (20) How do you call a sacrifice made not for, but by the god? (21) Wears a mask, strikes at night, but not as filthy as a heretic? (0) Why did a king say he would give me a dollar? Why did a chicken cross the river? No idea yet other than really silly childish random guesses. What patterns we do have there? I looked upon to the numbers of setups and punchlines, but since the OP argues that they are randomly ordered, it probably have nothing to do with that. So, I really don't know yet. The ethimology of the word dollar comes from thaler, a coin that started to be minted in 1518. About pence, it dates back to 1394 or earlier. Puss in boots appeared by the first time in 1550-1553. The word "Hobbit", at least as how it is understood today, seems to be invented by Tolkien in the 1930s. However it could be an obscure older term from XIX century or even from 1594. Shakespeare's play King Lear (1603) contains a reference for "Hobbididence, prince of dumbness". This is not really medieval, since the Middle Ages ended in May 29th, 1453 with the fall of Constantinople. The period better matches with the renaissance. Not the answer you're looking for? Browse other questions tagged pattern knowledge steganography anagram humor or ask your own question.